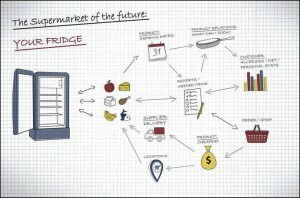 The Supermarket of the Future: Is Information and Connectivity more Crucial than Physical Products? The challenge for supermarkets today is balancing the needs of the customer against their ability to serve those needs. How are supermarkets and food manufacturers preparing their business for e-readiness? What about more customer centricity? Currently, brands are not particularly good at serving consistent product information across in-store and online environments, leading to lower conversions and poor customer satisfaction. This shortfall is also preventing these brands from moving forward and innovating with new technologies. As a result, Master Data Management (MDM) is becoming a significant focus in effective omnichannel And Supply Chain initiatives. Consider the large range of products that can be seen at the average grocery store. The sheer number of categories is staggering, before you even consider the quantity of items in each category. There’s little wonder of local brands are struggling to replicate this level of product data anywhere else but on their store shelves. Furthermore, consider the various kinds of information supermarkets are expected to include. Then, add to this the kinds of information supermarkets could include in order to present a competitive advantage over and above the rest. Information types currently possible are: Ingredients, additives, Images and videos, marketing copy, gene manipulation information, references, product seals, allergens, nutritional facts, translations, product categories, expiration/use-by dates, variants, region-specific information, GSDN information and more. Ultimately, supermarkets are already on the path of improving consumers’ shopping experience and a few of the emerging technologies indicate the way this industry will continue to evolve. The below six examples demonstrate an emerging trend in grocery shopping, while also highlighting the need for accurate product information creation, curation and distribution. Ready-to-cook product bundles: Nice and very customer facing concept is done by German food retailerkochhaus.de(meaning house of cooking). The only offer product bundles of all ingredients which are required to cook a certain meal for the required number of guests. It can be seen as the look books which are well established at fashion brands and retailers sales strategy. Self-checkout Systems– More supermarkets are beginning to include self-checkouts. American, Asian and UK companies lead, Germany or Australia are behind. But there is the same risk of cart abandonment here as there is online, so providing a comprehensive and rich suite of product information at these POS systems is crucial. In-store Information Kiosks– Some supermarkets are beginning to include interactive displays in-store, with some even providing tablets mounted onto shopping trolleys. These displays serve in place of an in-store sales assistant, providing consumers with directions, promotions and complete access to product information (such as stock levels) on any item in the store. One of our customers is using our master data fueled app Product 360 to direct shoppers on The floor and Reporter to Save 100,000s of dollars with fueling electronic shelf labels. Supermarket Pop-ups– Food retailers are increasingly experimenting and improving the traditional shopping experience. One example that has turned the bricks-and-mortar concept on its head is electronic shopping ‘walls’, where products are prominently displayed in a high-traffic area. Consumers are able to access product details and make purchases by scanning a code presented alongside the image of a given product. Store-to-door Delivery Services– It’s starting to become commonplace. Not only are supermarkets offering same-day delivery services, the major brands are also experimenting with click and collect services. These supermarkets are moving toward websites that are just as busy and provide as much, if not more relevant content as their bricks-and-mortar outlets. App Commerce:Companies, like German food retailer Edeka offer an app for push marketing, or help matching customer profiles of dietary or allergy profiles with QR-code scanned products on the shopping list within the supermarket app. Due to the increased transparency brought on by the ‘Google Era’, retailers have experienced a marked decline in customer loyalty. This concept of omnichannel shopping behaviour has led previously loyal customers to shop elsewhere. Putting customers in the centre of all retail activities may not be a new trend, but in order to achieve it, retailers must foster more intelligent touch points. The supermarkets of the future will combine both product and customer data in such a way that every touch point presents a uniquely personalised experience for the customer, and a single, 360-degree view of the customer to the retailer. The major supermarket brands already have comprehensive customer loyalty programs and they’re building on these with added products, such as consumer insurance packages. However, these initiatives haven’t necessarily led to an increase in loyalty. Instead, the imperative to create a personal, intimate connection with consumers will eventually lead to a return in loyalty. The supermarket of the future will be able to send recipe and shopping list recommendations directly to the shopper’s preferred device, taking into account any allergies or delivery preferences. Gamification as a tool for loyalty? Moreover, this evolution will slowly lead into another phase of loyalty marketing: gamification. Comprehensive and detailed product data will form the basis of a loyalty program that includes targets, goals and rewards for loyal customers. The more comprehensive and engaging these shopping ‘games’ become, the more successful they will be from a marketing and loyalty perspective. However, the demands for detailed, accurate product information will also increase accordingly. Private side note: My wife likes the simple Edaka App Game, where users need to cut slices of sausages. The challenge you need to hit exactly the weight the customer requires, like the in-store associate. Those supermarkets that can deploy these initiatives first – and continue to innovate beyond this point – will have a bright future. Those that lag behind when it comes to leveraging their information and real time process might quickly begin to fade away. What can I cook of my fridge remains? Do they all match with my dietary and here allergy to nuts? When will they get delivered? What things can make our evening a success? The right wine recommendation? Two candles? Well it is up to your imagination which products also can be sold in addition to make the customer happy and create a nice candle light dinner… But at least a good reason to increase the assortment. At the end of the day the relationships between location, product, customer and supplier are building the foundation of this customer experience. Hur ser framtidens handel ut? Syftet med bloggen är att engagera och lyfta fram tankar och visioner om hur vi gör affärer med varandra – idag, imorgon och på lite längre sikt.